On the day that we photographed him for the Bahamian Project Count Bernadino had brought along one of his steel drums. We carefully set it up in front of the camera and he proceeded to plink out a famous melody for us – it was Frank Sinatra’s “I Did It My Way”. During the photo session Franklyn ‘Count Bernadino’ Ellis recounted how he got started in the late forties. He said after getting out of military service he got a job washing dishes in a big, popular New York restaurant. The restaurant owner soon discovered Count Bernadino could play the guitar so he was given the opportunity to entertain the customers. It was also during this time that he met and joined with a group of musicians from the West Indies and formed the Bacannals Band. For the next several years he led the band as they toured the United States, but eventually he wanted to return to The Bahamas he said. 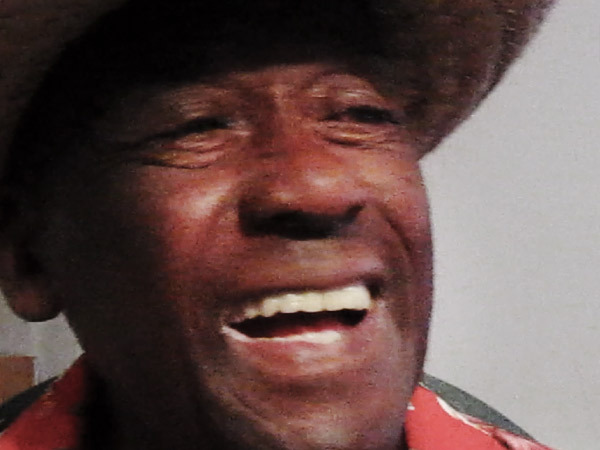 In the late fifties the Ministry of Tourism approached him and for a few decades following he would perform all over the world as a musical ambassador of the Bahamas attracting visitors to the country. Count Bernadino did it his way and it has made him a Bahamian legend. I would love to be kept up to date. Thank you. Please sign-up for our newsletter so you can be kept up-to-date on the progress of the Project and related events. We are close friends and have got together every time I've visited the Bahamas. A true gentleman with a keen sense of humor and contagious laugh. In the 70s, he almost became my step-father, but things didn't work out. He still calls me son. We love you Count! I will always remember the 3 years spent with Count, his band and many friends. He took me along to all his engagements whenever I visited the Bahamas and I even took him scuba diving for the first time, which he really enjoyed. I hoped to see him last December while on a cruise, but he had the flu and we didn't get together. So many great memories. You may or may not remember me, but you may remember Patsy Aranja, her son, Ricky, cousin Mike Miller and Randy Peach. Patsy arranged for us to meet you when I was a kid of 13. We came over to Nassau, stayed there for three weeks and played courtesy of you opening doors for us. We played The Banana Boat and the British Colonial Hotel (The BC). It was an amazing experience for three kids in junior high and elementary school to be able to play "overseas". Thank you for this wonderful memory. I trust you are well. P.S. I am still playing and LOVE all styles of music to this day! I was General Manager at the British Colonial in 1973/74 and Count Bernadino worked for me in The Britannia room alternating with King Eric and his Knights. Count was a brilliant Calypsonian in the true meaning of the word. He was the forerunner of the modern rap singer, being able to spontaneously sing about anything and with great humor, making it up as he went along. I hope you are well, and if you see him give my regards to Obby Marshall.